The following is from the Perfect Bee Facebook Page: "At this time of year beekeepers install new hives and overwintered colonies start exploring again, after the winter cluster has worked its magic. In the next few weeks there will be a focused effort by our bees to build up their numbers. But for the smaller or weaker colony there is another challenge. A good example is the installation of a package of bees. A common and effective way for new beekeepers to establish their first hives, a package results in around 10,000 starting out in a new home. But 10,000 still represents a small colony. While the numbers expand, there's always the chance of robbing. A colony may not have the capability to successfully defend the hive. Our article "The Threat of Robbing" looks at why and how robbing occurs and what steps you, as a beekeeper, can take to help your bees protect their space." 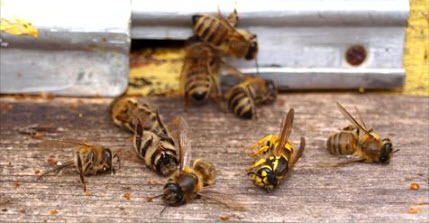 Read text and view videos at Perfet Bee's Blog post by Mark Williams: "The Threat of Robbing."